HEAVEN 17 will be touring their platinum selling second album ‘The Luxury Gap’ around the UK and Germany this Autumn. Featuring their classic hits ‘Come Live With Me’, ‘Let Me Go’, ‘Crushed By The Wheels of Industry’ and ‘Temptation’, the album’s resonant social commentary is wholly fitting in the current economic climate. Back in 1983 when the album was released, Glenn Gregory, Martyn Ware and Ian Craig Marsh flew the red flag for the Socialist Republic of Yorkshire with their witty observations of the greed and yuppie culture in the Thatcher era. Perhaps more obviously pop oriented than its predecessor ‘Penthouse and Pavement’, ‘The Luxury Gap’ had a glossy sheen which combined synthesizer programming and digital drum computers with orchestrations, brass, jazz piano, rhythm guitar and paving slabs. Glenn Gregory, who had been working as a photographer in London, was recruited into HEAVEN 17 following the split of THE HUMAN LEAGUE Mk1 in 1980. 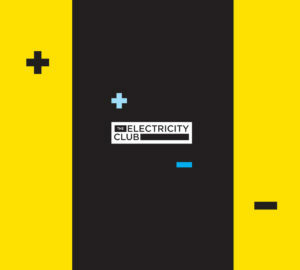 While Phil Oakey found two girls “in a cocktail bar”, Martyn Ware and Ian Craig Marsh formed BRITISH ELECTRIC FOUNDATION (BEF), a production company along the lines of THE CHIC ORGANISATION to best utilise their talents. Among their first projects were the instrumental ‘Music For Stowaways’ cassette and the ambitious covers album ‘Music Of Quality & Distinction Vol 1’. Although he was partly involved in both, Gregory became lead singer for what was to be BEF’s pop outfit, influenced by the soul funk fusion of THE JACKSONS as well as the electronic music technology that had now become more affordable and user friendly. ‘Penthouse and Pavement’ was a critical success with steadily increasing sales but with the mainstream appeal of ‘The Luxury Gap’, HEAVEN 17 eventually took priority over BEF. 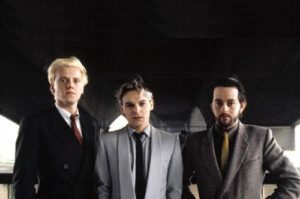 The period between 1981-84 is often considered to be HEAVEN 17’s imperial phase but during this period, they didn’t actually perform live, save a few live vocal / playback appearances in clubs for promotional purposes. There’s a 2CD/DVD box set of ‘The Luxury Gap’ about to be released– what can fans expect in terms of rarities? That’s a shame because moving from that KRAFTWERK meets SOFT CELL demo to the electro-soul fusion…that’s quite a transformation? Yes, quite a lot of our early demos were much more electronic and we were writing with similar equipment to THE HUMAN LEAGUE. It’s only afterwards when we went into the studio that we started to experiment and change the way we were conceiving and perceiving the songs. For instance, it took us a long time to find a girl for ‘Temptation’. Martyn had the idea for the Motown backbeat but it’s still very electronic really… there was this part that built and we decided to try an orchestra. So we were in the studio with this massive orchestra and it was like “oh my god”, it was amazing because it was so different. It was a complete game changer. What inspired ‘Come Live With Me’? So there was this “she’s half your age” thing and all that kind of stuff but it started to be about word play. “I was thirty seven – you were seventeen – you were half my age – the youth I’d never seen”… the words were making us laugh! It was all messing around! That’s where it all came from and we were quite surprised we’d written quite a beautiful song by the end of it because we were laughing like mad. It changed so much from the demo and we wrote it in my flat on a TEAC 4 track. We had a tiny Yamaha keyboard and we came up with that melody which was almost film soundtracky. It was beautiful but as the song steadily got bigger, it went through a whole heap of changes. But we kept the TB303 Bassline. It needed some balls so we put bass guitar on it but it didn’t work. Then we added these low piano notes like ‘Vienna’ and that didn’t work! When we finished ‘Let Me Go’, we realised we’d lost the original beauty of the demo so we did it again… so basically, ‘The Best Kept Secret’ is ‘Let Me Go’ but redone with an orchestra. So we got two songs out of it. It took a lot out of us but it gave us so much more back. We really do love that track, it’s a great song to sing. It’s very emotional and it’s great for my range, I can really belt it out. It gives a lot back that song. You’ve talked about seeing ULTRAVOX play The Roundhouse and how vibrant the show was – did you draw inspiration from that when you put together the HEAVEN 17 / BEF weekend and debuted ‘The Luxury Gap’ live there? Yes, that is absolutely true… Midge invited me and Martyn down. I had never actually been to The Roundhouse before and I went not knowing what to expect from a revamped ULTRAVOX or The Roundhouse and how the sound would be. But I was absolutely blown away by the artistry and sincerity of ULTRAVOX and the audience were amazing. They didn’t milk anything or act like ‘comeback kids’…to me, it was like watching THE KILLERS! I thought “this is an amazing place”, it was like a happening. I felt privileged to be there and that’s what put the idea in my head. And then Peter Price at William Morris Agency suggested doing the weekender with BEF thing which Midge loved the idea of. That weekend must have been quite tricky to co-ordinate with all those high profile artists making an appearance? That was just so much work to pull all that together. We got people to say yes and to turn up at odd times for rehearsals. But we hadn’t really thought about the night itself. So there was all these people singing and we realised we’d need a stage manager! So Martyn got this mate who worked at the Royal Opera House who does that. She made the backstage bit run really smoothly. At the end of the weekend, I needed four nights off! Any tense moments for you or did you just let Martyn sweat it out alone? What are you singing on the new BEF ‘Dark’ album incidentally? I’m singing ‘It Was A Very Good Year’ which was made famous by FRANK SINATRA. Martyn has scored it, but using just System 100 and synths so it’s really odd and weird. He’s done a really good job of it. So what’s the format for the upcoming tour – you’ll be playing ‘The Luxury Gap’ again – can we expect any surprises… more HUMAN LEAGUE songs? You and Claudia Brücken were in The Independent recently about how you both met and she’s was saying you should do new material…is there a chance of a new HEAVEN 17 album – how are the odds looking today with regards to going back into the studio? We’ve got to take a different view of it and have a different head on… it’s partly me, and Martyn as well. We could easily write a couple of tracks, sing them and put them out…that’s fine but there’s something in us that thinks “if we’re going to do it, we would want to do it really well” and that might mean using an orchestra or working with other people. It’s going to take more effort. BUT it doesn’t have to be that, we could just do it. For instance, I did the track for John Shuttleworth in about 3-4 days and it’s sounded great, Martyn said it was “awesome”…and I was just messing about really! How was performing with Claudia Brücken at The Scala and Bush Hall? You did ‘When Your Heart Runs Out of Time’ live with her. The original recording you did for ZTT was produced by Midge Ure under the alias Otto Flake Junior, have you any interesting memories of that? Paul Morley got the gig for the ‘Insignificance’ film and had the idea of putting me and Claudia together to do this Country and Western track written by Will Jennings. It’s at the end of the film, it was just a very funny thing to do. The video for it was hilarious; Paul said “The premiere’s tonight in Haymarket, why don’t we get Claudia in a white dress all Marilyn Munroe-esque, you get your suit on and we just film you lip-synching to the song as people are leaving”. So this ‘Durch Die Nacht (Into the Night)’ documentary for German TV with Midge Ure…how did that come about? It looked a fun night! It was a lot of fun, Hasko Baumann, the director, contacted Midge about it. The concept is they arrive at your house and follow you… they don’t say anything or interfere. You also did backing vocals on ‘The Gift’ track ‘Antilles’ and you co-wrote ‘Personal Heaven’ with Midge for X-PERIENCE which was a hit in Germany. Any chance of you doing you more work with him? Yeah, it’s funny, I said that to him the other day. We get on really well and we’re good friends. When he came round, I was playing ‘Wild Is The Wind’ on guitar and he said he loved it, we like the same things. So I said “You know what? We should just do something together”. Instead of half a day’s work, we should really consider doing something together… I think people would be interested. It’s never really occurred to us, we’re just friends outside of music really. There’s a book due out shortly by David Buckley called ‘Electric Dreams: The Human League, Heaven 17 and the Sound of the Steel City’. Are you involved in this? I’ve done a couple of interviews for it, but there’s been a few delays for various reasons. With all the recent HEAVEN 17 activity of the last few years, do you miss Ian Craig Marsh being around at all? We are still really close… I say “are” even though we’ve not spoken to him for several years. He just very slowly stopped being in contact with Martyn first, then me. And then Lindsay, my wife who was always the one who could get him to answer, he stopped with her too. He then just totally disappeared. And when we started to do stuff again, we emailed him and asked if he would like to be involved… we didn’t hear back, so we asked again… nothing. Then we said “If we don’t hear back, we’re just going to do it anyway and presume that you don’t want to do it”.